Proposed for Western Ave near the UAlbany uptown campus. 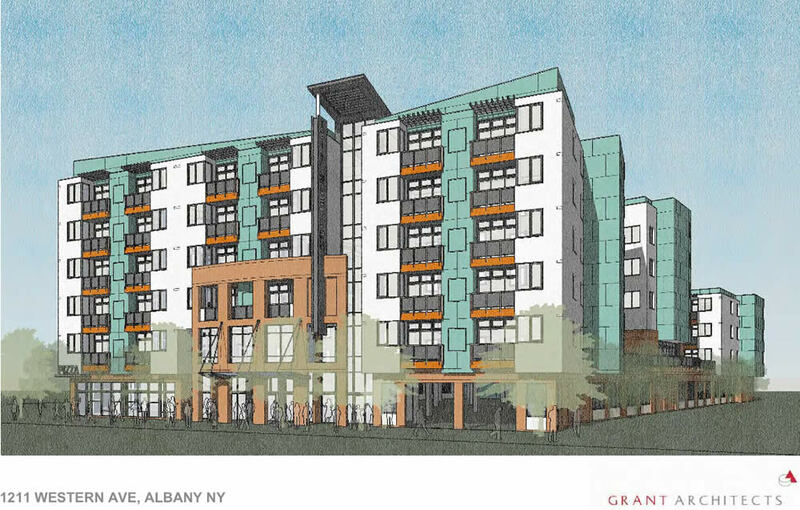 Two large residential projects are on the agenda for the Albany Planning Board meeting next week -- one across from St. Peter's Hospital on New Scotland Ave; the other on Western Ave near UAlbany. + Demolish and rehab a portion of the existing buildings on the retail strip, which currently include a US Post Office and empty space that had previously housed a drug store and, for a recent fleeting moment, a mattress store. The new space would included roughly 14,000 square feet for retail and a restaurant. There'd be a subsurface garage with approximately 78 spaces. + Construct a new 88,267-square-foot apartment building with approximately 93 units on parcels at the end of Onderdonk Ave (the portion from New Scotland Ave). An existing garage would be demolished to make room. There'd be basement-level parking for +/-79 cars and surface parking for 81 +/- cars. 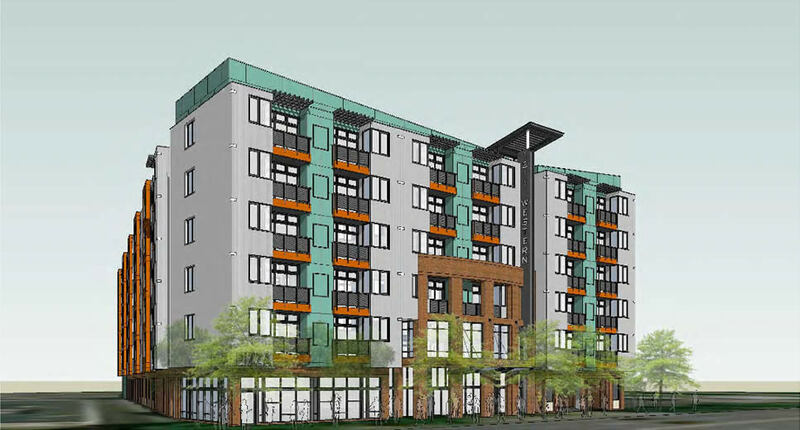 + The 33 units of existing apartments in a complex that faces South Allen would be upgraded. + An existing home at 313 South Allen that dates 1911 would be demolished to make room for a driveway. There are large format renderings of the proposed project at the top -- click or scroll all the way up. This looks like a potentially transformative project for this neighborhood retail strip near the intersection of New Scotland Ave and Manning Boulevard. It also looks complicated, so we suspect there will be much discussion about it at the meeting. Update: The developer is holding a community meeting about the project Tuesday, November 14 in the social hall at Temple Israel (across the street) at 7 pm. + The building would include roughly 12,000 square feet of office space and about 1,400 square feet for a "quick service" restaurant. + It would also include three levels of indoor parking with +/- 192 spaces. 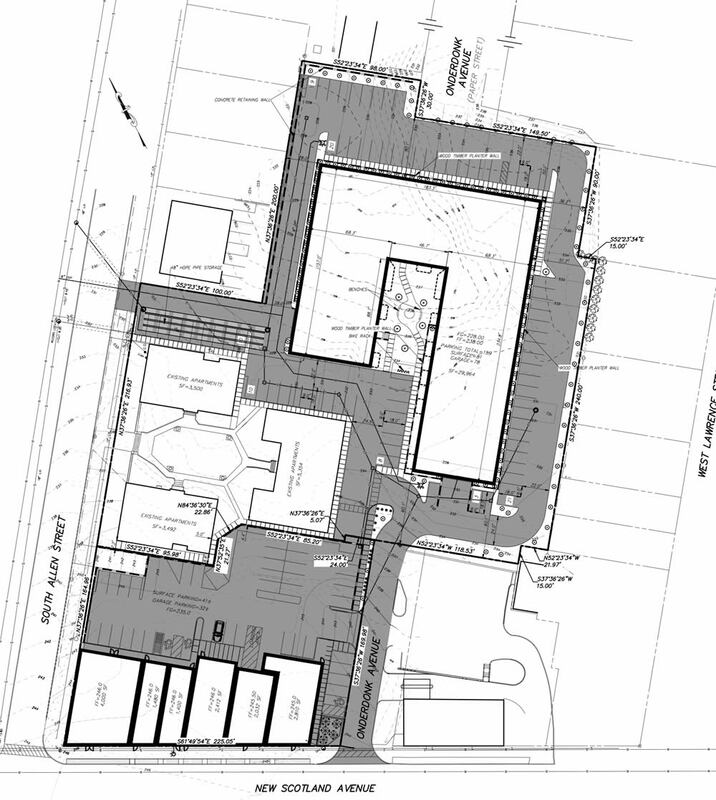 + To make room for the new building, an existing 12,000-square-foot office building on the site would be demolished. There are a few large format renderings at the top -- click or scroll all the way up. 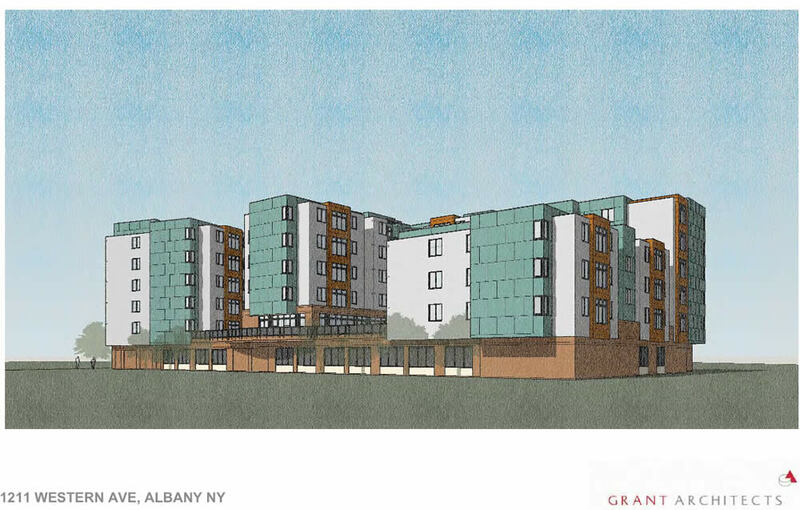 If this project ends up getting built, the area surrounding UAlbany's uptown campus will have added 926 beds in private dorm space over the course of about 5 years. I am 100% for something taking the place of that Post Office building. It's definitely an eyesore, not to mention the empty store front and parking lot area next to it. However, have these developers tried driving down that part of New Scotland in the afternoon on a weekday? Where do they think 80 more cars are gonna go? The roads not getting any wider. Keep the restaurant and retail and ditch the apartments. Wow I am shocked at the rate of these new housing projects. Very good news for Albany. I'll take additional housing pretty much any way I can get it. But I truly hate this "mixed material" look, like the new building across Washington from UAlbany that's visible from 90. It is disgusting. Like really, teal sections and orange balconies??? Anyways, hear hear for more housing! Like previously mentioned, I don't see how you can add all of that to that spot on New Scotland without the traffic becoming unbearable. During rush hour and random other times it takes a considerable amount of time to get through that stretch, adding all of this housing and retail will only make it worse and there isn't room to expand the roads. I'm all for growth but it cannot cause a detriment to the existing neighborhood. Does anyone know what is behind this surge in city residential development? Is it the new zoning code? The national economy certainly is not much better than the economy of last year or 2015. I am aware, however, that there seems to be time lag in growth in the Capital Region. Maybe this will stop Saint Peter's from using that strip of New Scotland as their smoking area. I would love to see some restaurants and retail on New Scotland across from St. Peter's along the line of what's sprung up farther down on New Scotland. (I mean between Ontario and Quail, not that soulless mess farther down by Albany Med.) St. P. is a mile from my house and I'd love to see our end become a walkable neighborhood with some place to walk to. I groaned with disbelief when that mattress store opened because it was such a pointless retail operation for a residential neighborhood. But what about the post office? I recall that closing post offices has caused a lot of community consternation. They closed the one on Delaware and the one on South Allen. Would there then be no post office for a whole section of Albany? I'm not sure that worrying about traffic is the right approach. We should have no development in Albany then because it might increase the travel times for suburbanites? The whole reason traffic is so bad on New Scotland is because all of the new development has precisely been in the suburbs, forcing people to drive everywhere. This is a awful idea !! New Scotland Ave is already so taxed from the hospitals and colleges . Albany needs to stop and think of its already established residence before asking them to bare anymore traffic . @Sean: As I understand it, the "mixed material" look is largely a function of cost -- it's much cheaper than, say, brick. That paneling is also lighter. @PK: There are probably a lot of reasons that are contributing to the recent mini boom. I get the feeling that some projects had been held off because wanted to see how the zoning was going to shake out. I suspect the fact that financing is relatively cheap right now is another. But the short, overarching answer is almost certainly demand. These new apartment buildings are renting briskly. As one developer said to me, as long as they keep renting, they're going to keep building. @chrisck: Finding out what's up with the post office is on my list. Looking forward to the 1211 Western project. This seems like a way to add vitality to that underwhelming strip next to UAlbany, without encroaching into the owner-occupied neighborhood. Would like someone to pick up the demolished Catholic school site and do 2-4 floors of retail/housing on that. "Where do they think 80 more cars are gonna go?" Probably in 200+ parking spaces on site. On the one hand, the traffic on Western is bad enough, and there is tons of litter from students (and others, one presumes) just throwing their food packaging, etc. onto the ground. On the other hand, maybe we'd get a car share car and some bike share bikes up here. almost forgot can we please get a new bus station that doesn't harken back to the days of the movie Taxi Driver set in Calcutta?? I pick up my relatives from outside the USA here often and between the Albany bus station and the Port Authority in NYC they cannot believe that this is the USA....neither can I! Little effort, as I see it, has been has been revealed concerning traffic control. New Scotland Ave. would require widening or significant lane modification from beyond Manning Blvd. outward, and to Main Ave. and beyond city bound. Similarly, South Allen St. would be affected from New Scotland Ave. to the Pine Hills area, presenting an existing residential nightmare that, to say the least, would cost much more than the proposed building project by itself. Have these people actually prepared a traffic study? To all the people complaining about the design of the buildings... Would you prefer more of the soulless BBL/Columbia style buildings that have dominated construction in Albany the last 15 years? At least these buildings have some color and feel at least slightly more contemporary. Are they inspiring? No, not really; but they are a tremendous improvement over what is currently at either site. I would like to see the retail buildings on New Scotland ave to add a second (and/or third) floor for residential, but the proposal is still decent. As far as traffic is concerned, Albany is a city as many have pointed out. This is a walkable neighborhood already, and I think that this new development would only add to that. If traffic is backed up on New Scotland, there are many other routes one can take. I don't see the new building on Western having much if an impact on traffic, it will just pull more students out of Pine Hills. I'm not sure if that is a good thing or bad thing. In the long run, I think it may force landlords in the Student Ghetto to upgrade and maintain their properties to be competitive. Overall, these new projects seem like a positive thing for the city. Not the greatest design in the world, but I guess it is very expensive to build new buildings these days with the price of raw material, so most new construction likes this looks cheap. Probably not a lot you can do about it. I don't mind either of these, but if they are getting huge tax breaks or will pay not taxes for a long time, then no thanks. If they are paying their full freight of taxes, then build away! agree somewhat about the "soulless" BBL buildings but they are not all that bad. Better in general than anything I can see built between 1961 and 1999. They are cookie cutter and bland but they at least neat orderly and reserved. Anyone else care to pick the over under date when fake "stone" cladding of buildings will be looked at like pink bathrooms or shag rugs??? That retail strip by St Peters does need to be fixed up. Traffic is already a problem. Someone said take other routes... ask the people on Buckingham how that is working out. Rental market is already full. Park South got tax exemptions, other devs will expect the same even if they deny it now. Pine Hills residents, I would hope, would want to preserve and promote the neighborhoody and family oriented environment the area has. Large apartment blocks will do the opposite, they target temporary residents without long term investment in the area. I expect these will be approved, because the local government here can't look further than 30days out. After these are built they will, lose money, owners will get tax breaks then walk away / sell, building will rot and turn to subsidized housing, schools and infrastructure will be more overcrowded, property values will crash, taxes will climb to compensate. No one who owns in the area should be supporting this. The traffic! The Traffic! Folks, please stop and ask yourselves: Where is the traffic coming from? Is it coming from close to St. Peter's? NO. It is coming from outside the city. Do those folks live here? No. Do they or their employer pay property taxes here? No. So what's the plan for Albany to be more competitive, to attract new residents, that won't just drive our streets but enjoy our amenities, support our businesses, meet their neighbors and WANT to live here? If a developer wants to develop their property in a manner that supports walking, biking, using transit, and attracting net new residents - while at the same time modernizing stormwater management and improving long neglected streets-capes then let's be a bit more welcoming. It never ceases to amaze me how bitter folks are about new and different. Why have a "Welcome to Albany" sign at all if we're a city of negativity? You'd think that residents of Albany would be encouraging new development in our city. I know I am. The way I see it is the more projects like these (clean, modern, mixed-use, walkable, etc.) that are built, the more vibrant Albany becomes. The more vibrant Albany becomes, the more residents and businesses will be drawn here; thus increasing the tax base. Aren't you sick of everything new opening in Colonie, Clifton Park, Saratoga, etc. while Albany gets passed over? @AlbRes - Do you really think traffic is that bad in the New Scotland area? Maybe for an hour or two a day, where it backs up between South Main and Manning. That's about it. In regards to the residents of Buckingham; how will this development impact them in any way? The apartments will be for RESIDENTS, not commuters. Besides, I'm sure that highway portion of Route 85 has been there much longer (completed in 1968) than the majority of residents on that street. It's just another example of people "moving next to an airport, then complaining about the noise" (or people moving to Lark Street and complaining about the nightlife). If you don't want to deal with living on a neighborhood "thoroughfare," don't move there. There are plenty of other streets you can live on. Imo, the daleyplanit post makes some of the best comments on this situation. I live a half mile from the New Scotland spot. I work downtown. Before kid, I took the bus, biked or walked to work. Now I drive (in case said child gets ill.) When I need to go through that section at rush hour, I factor in extra time. When I am stuck in traffic, I sing or listen to podcasts. As long as the Post Office is part of the mix (really needed since the other closures) and as long as they factor in decent drainage solutions, it seems like an ideal way to add housing to an already tight market and make Albany more attractive to people who will pay taxes here. Yay! @AlbRes: neither of these projects are in pine hills. Please don't lump me in with NIMBY dismissals. The problem is the scope and style of the proposed developments, not development in itself. Retail, single family, 2 story duplex or townhouse style would all be welcome, not 100+ unit apartment towers. The infrastructure cant handle it, these developers won't improve anything past their sites. And this certainly won't be some magic windfall of tax dollars. Exemptions are expected and will be factored in because the standard was set with Park South. If they aren't granted now they will be mid development. AlbRes: No one is going to build new single family homes in Albany. There is no space, and the people who want those types of housing are people looking at the suburbs. There is no viable market in the city. Even new townhouses sit on the market. Amedore is having a very hard time selling brand-new townhouses in North Albany by Van Rensselaer Blvd, for example. Broken record here: Will these includes affordable units, at least at 563 New Scotland Ave? Each is proposed to have more than 50 units. Ditto what Daniel Naylor said above: "Abysmal uninspiring designs." Indeed. 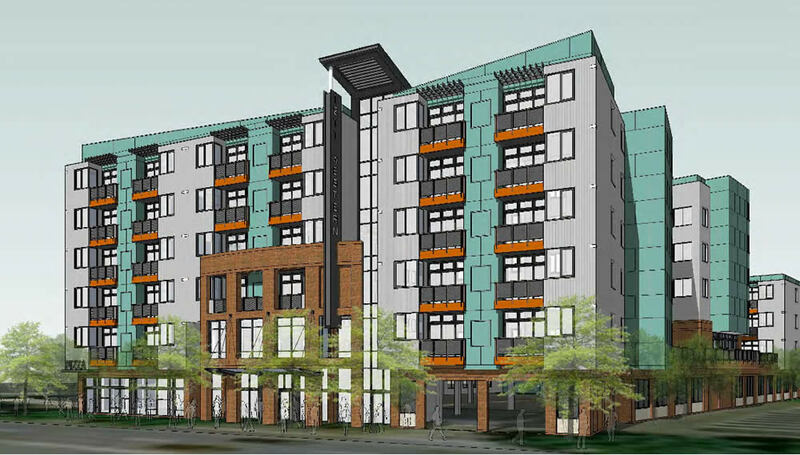 The New Scotland Ave. project in particular is unattractive, with all those different textures, colors, and even heights in the residential and retail portions. Both proposals lack any connection to Albany's built environment. What is with the Howard Johnsonâ€“like colors in the so-called private dorm for Western Ave.? determined by affordability methods used by the U.S. Department of Housing and Urban Development." Because these were in development review prior to 12/1, that requirement is not yet in effect.